This story is for my great uncle Billy, even though I never met him. It’s also for his sister, my grandmother. And it’s finally for the rest of us, for our curiosity about the reality of World War I and properly exploring history. But mostly it’s for Billy and gran. The story begins with a small, tin container. About a year ago, five or so weeks after my dad died, since his funeral and well into the What the hell now? stage, I found the container at his house. It was with some other family possessions, some going back into the nineteenth century like an old family bible and portrait photos. But I’m pretty sure I’d never seen the tin before, unlike some of those other things. It wasn’t much larger than a shoe box but it contained amazing items from Billy’s short life and – mostly – around his death. While I just said this story begins with this box, I mean the box gave momentum to the following 12 months. 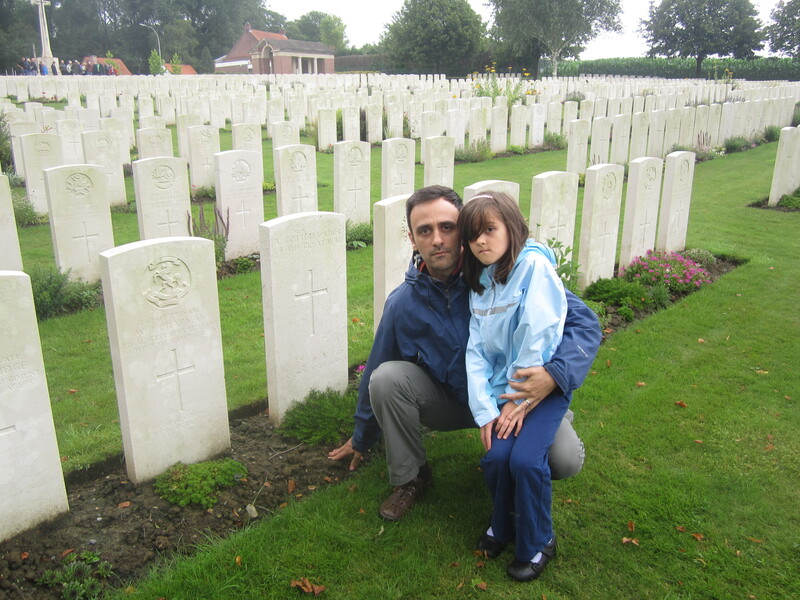 When I found it I decided, pretty much on the spot, that as his great nephew I would be the first family member to visit his war grave in France. Or was it Belgium? Or the Netherlands, even? I wrote about him once before on this blog, on 11 November 2012, when I told how my grandmother had never travelled outside Britain but had a visit to Billy’s resting place at the top of her list. I knew all that and lots more because as a kid my gran, born in 1904, recounted many stories about the family in the 1910s, 1920s, 1930s, the War years… you get the idea. I’d go as far as to say I knew more about great uncle Billy than my father did. After all, my father came along almost 20 years after Billy’s death and when he as an equivalent age to when I heard the stories he was going to school amid air raids and rationing. (The late 1970s were crap – just not for reasons in the same league.) My gran, as a mother, was way busier than those times she looked after me. So I promised I would make that visit for her, for all the family, now I knew where the grave was exactly and now – to be honest – I had that sense of things you must do when you reach a certain age, lest you never make it, like too many of the rest of my family. It turns out Billy was buried in quite a well-known First World War cemetery. My early research took me straight to Google Maps which showed it was only a short drive, maybe 45 minutes, north of Lille in France, though the location itself is just over the border in Belgium. But planning the logistics was easy. Before the trip, which took place last month, July 2014, I had months to make a much quieter journey, one on winter evenings through the container of documents relating to Billy. I knew that my gran was the youngest of four brothers and sisters and that Billy was next closest to her in age. I thought there was four years between them but it turns out there was six. As a kid, my gran always said her brother loved children, was fun and gentle, always smiling. They played together even though there was quite an age gap. All her memories were of a wasted young life, someone who would have been a fine member of society with a family of his own and who knows what else. 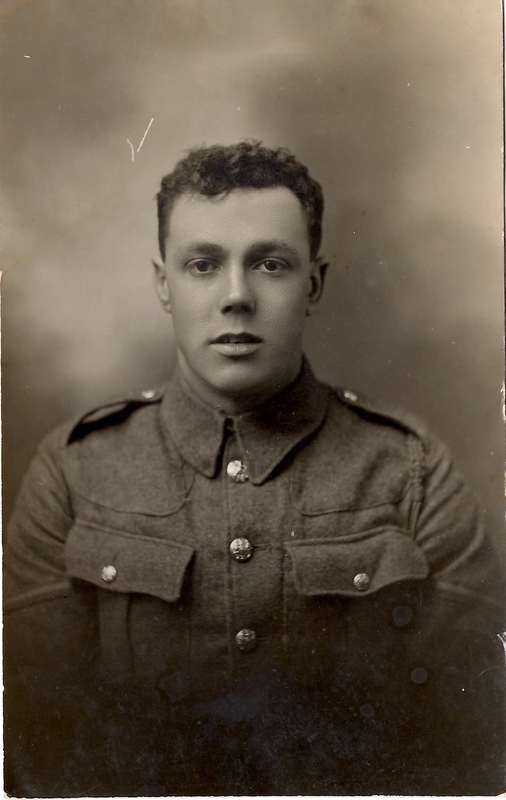 I had it in my head that regardless of official enlistment ages he was only 17 when he was killed, though the trip would confirm he was 19 at the time of his death, most likely (I’ll get to that) in battle in October 1917. In the box, the first things that grabbed my attention, time and again, were the photos. The first two here, to my mind anyway, were taken in a studio in England. The first one has a twee country lane backdrop. 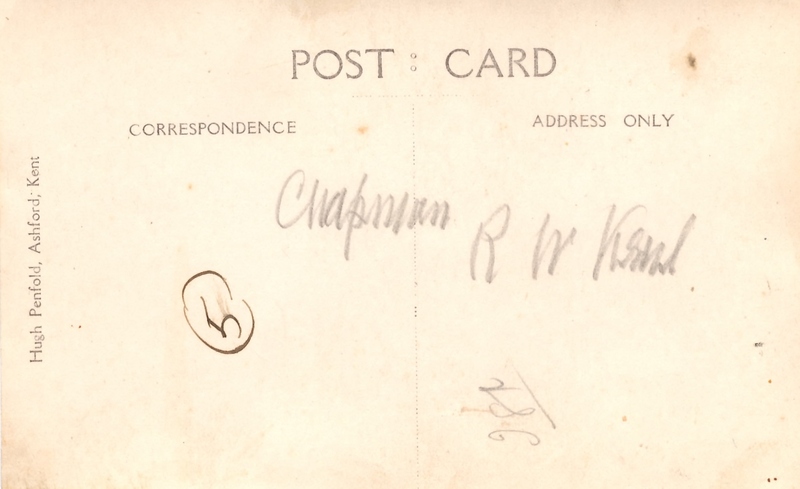 It was printed as a postcard, which was very common back then, and has nothing on the reverse. Perhaps, historically, someone would be able to look at what he’s wearing and confirm whether he was indeed a grenadier, as gran used to tell me, with all the extra danger that entailed. Or does the bugle he’s holding tell us something else? I can’t tell. Not yet, anyway. The second photo shows him from the waist up, perhaps sitting on a stool or bench. To me he looks more worried and less like my father than he did in the previous photo. I’ve scanned the reverse of the photo too. You can see it contains some wording which is another mystery. 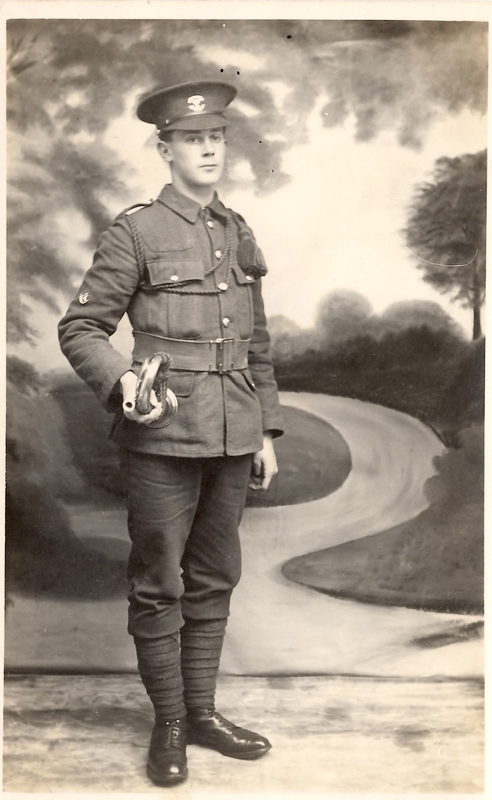 It shows an address on one end, for the photographer and studio, I assume – ‘Hugh Penfold, Ashford, Kent’. Then there is a number ‘5’ in pen, some small text in pencil (‘1st’, perhaps) and finally more words in pencil ‘Chapman RW Kent’. 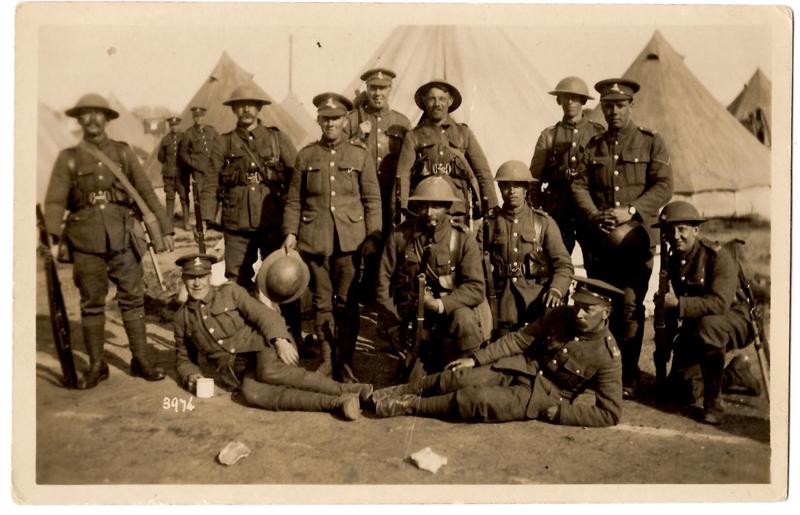 The last part, as confirmed in dozens of other documents, shows that he served in the Royal West Kent Regiment. I have no idea why that was. My grandmother’s family came from Yeovil in Somerset, my grandfather’s (the Halletts) also from that part of the world. Was there a way someone from there could easily serve for a unit of the army in the south-east of England? Was that a thing? Again, my ignorance – for now – gets the better of me. Included in the tin box was one pristine RW Kent badge. Another, in a moment, would go on to blow my mind. Two photos showed the war grave, so were clearly taken post-War. One is an up close shot. 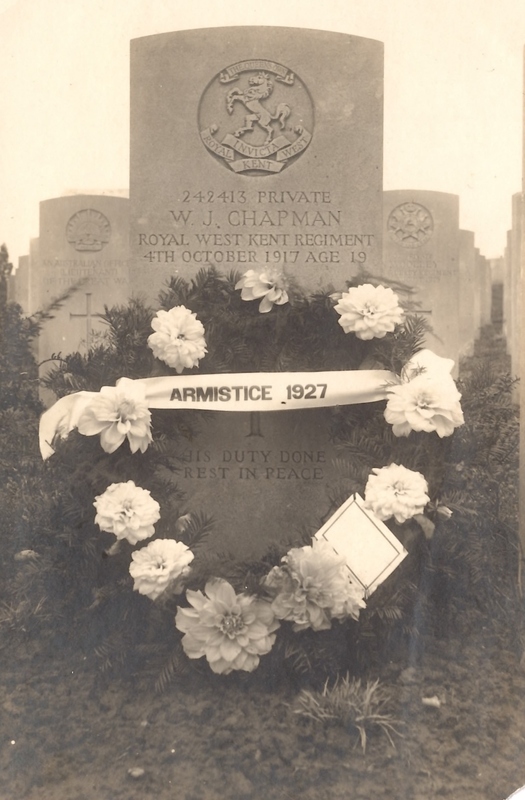 My deduction, in line with some other correspondence with the government, is that it was from the War Graves Commission in 1927 and basically showed Billy’s headstone in good condition, with the inscription just as I would see it last month. There is an impressive garland of flowers and when we visited I was struck but how perfectly the graves and greenery around them are maintained. It was the same throughout that part of Belgium, from large cemeteries like the one where Billy rests, with around 5,000 souls, to smaller ones with maybe 50 headstones. You see them dotted all over the countryside. The second shot is a view of the whole cemetery. I don’t know exactly when that one was taken but I recognised that very same view from the roadside, as soon as I arrived. The big difference is that now the surrounding fields are productive farmland full of corn stalks and there are trees which must be almost 100 years old, spaced evenly, elegantly framing the cemetery. But I think my favourite photo from the whole collection is this last one. It shows Billy and his comrades. From when? It looks possibly like it’s from the front. But maybe not. There are no trenches in sight and they look in good spirits. So was it maybe in Kent or in France, on the way? But there are tents and more than half the men are wearing the recognisable Tommy helmet (to give the item just one of its nicknames). I feel like they could have easily been going in to battle soon. Who would survive? How did such a photo come to rest in my hands? I’ll never know about its first years. Billy is standing. He’s second in from the right, in his dress hat but – I’ve just noticed this for the first time – holding his tin hat. I want to say he looks brave. Some of the men are smiling. Looks like a couple have a cigarette in their mouth. Two in the background appear to be photobombing the whole thing. One last thing about this – and no comment on the ‘taches, very much the style – is that Billy has a stripe on his arm by this time. 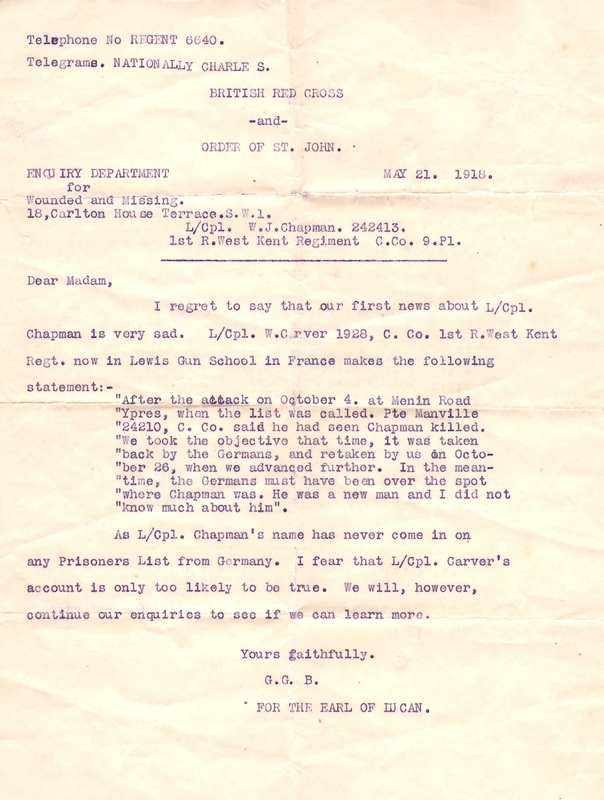 In correspondence he is usually referred to as ‘Private Chapman’ but occasionally we see a ‘Lance Corporal Chapman’ or ‘L/Cpl.’ and this would appear to confirm that. Could he have been promoted ahead of fighting? I don’t know, I guess it’s possible. How many times did he engage before the fight in which he died? My grandmother made it sound like he died almost as soon as he got to the front. Again, I will probably never know. 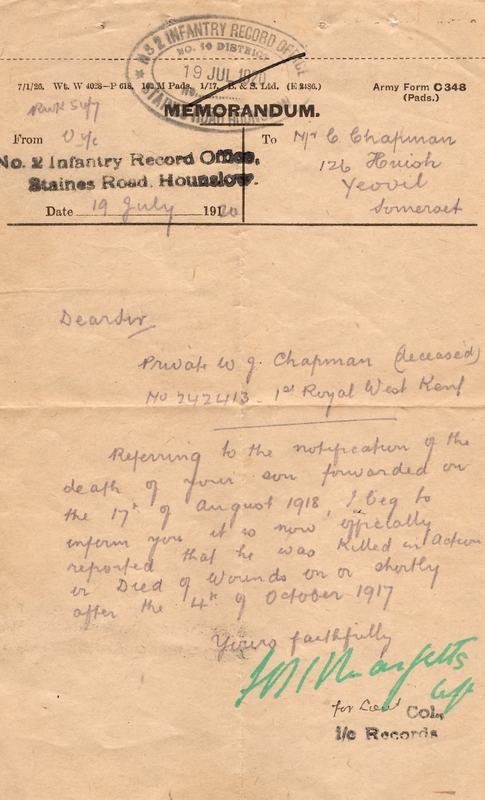 What struck me next, among all the items, were the letters relating to the confirmation of his death. You have an image in your head, of a knock on a door, a telegram being delivered, a grief-stricken mother or wife, of tears – of it all played out a million times and in different countries. But the letters from government departments (‘Enquiry Department for Wounded and Missing’, ‘Imperial War Graves Commission’ and so on) paint a picture of uncertainty. As L/Cpl. Chapman’s name has never come in on any Prisoners List from Germany. I fear that L/Cpl. Carver’s account is only too likely to be true. We will, however, continue our enquiries to see if we can learn more. As I write that, I get an eerie feeling that last person to type those words was in that government office, on an old typewriter 96 years ago. There then follow half a dozen other letters, one officially confirming the bad news (though I’m not sure the family would have held out hope after what was written above, not hearing word from Billy and the small fact that the letter is dated after the war ended), but mostly they start to come from the Imperial War Graves Commission and are to do with the grave itself. By 9 December 1920 a letter from that commission’s office (33-38 Baker Street, I’m thinking it’s long gone), reveals that Billy’s final resting place at the Hooge Crater Cemetery, Zillebeke, was only after he was moved from a smaller graveyard. 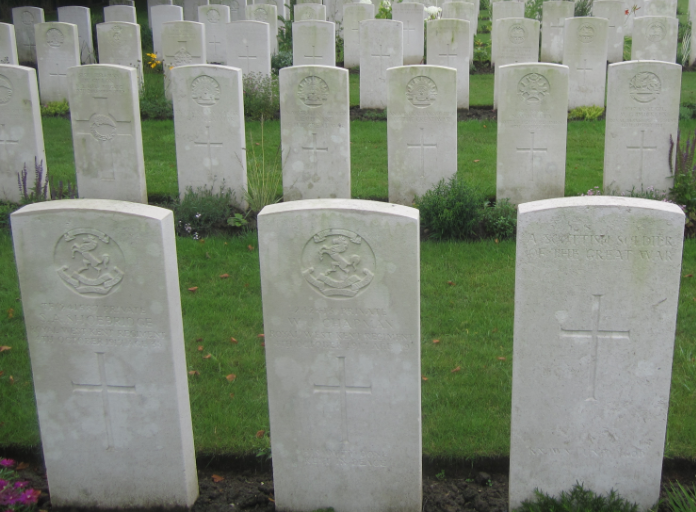 A letter read: “In accordance with the French & Belgium Governments to remove all scattered graves and small cemeteries containing less than 40 graves… it has been found necessary to exhume the bodies buried in certain areas”. I found out he had originally been resting at “a point north west of Gheluvelt”, which I haven’t got pegged on Google Maps. As well as detailing the new grave’s number, the letter to my great grandfather states: “The re-burial has been carefully and reverently carried out, special arrangements having been made for the appropriate religious services to be held” before ending “I am, Sir, Your obedient Servant”. I was struck again and again at that sign off. When today would you hear from the government the words “I am, Sir, Your obedient Servant”? Maybe if you’re someone who loses a loved one – not just in the military – in a senseless overseas death? I hope to never find out. My final two things to call out, among his possessions, are among those that have most affected me. 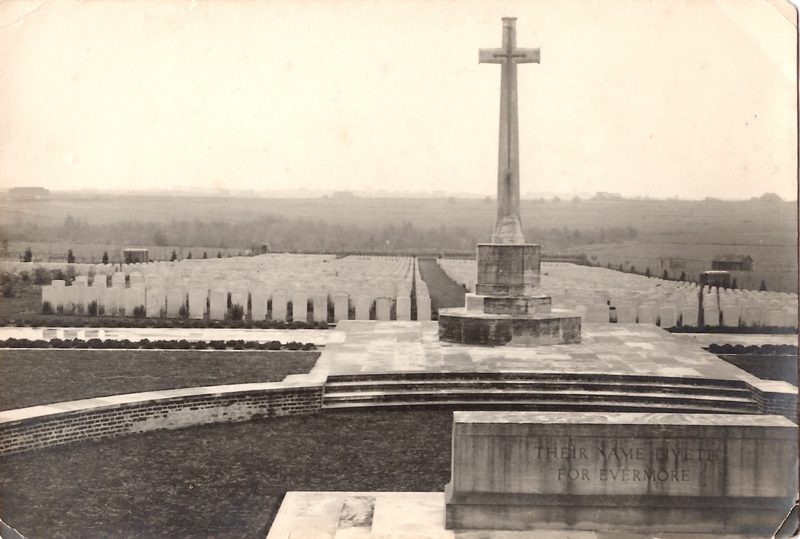 My gran’s family would have requested and paid for a book of ‘The War Graves of the British Empire’, just from the cemetery in Belgium (Part One, A-L) – remember, there were about 5,000 graves alone there, though some I would find out contain more than one soldier, many others were memorials to the unknown. The scan here shows the page where Billy is mentioned. Much like the hour or so I spent there, on a drizzly Belgium Sunday afternoon, I was struck by the names and namesakes. 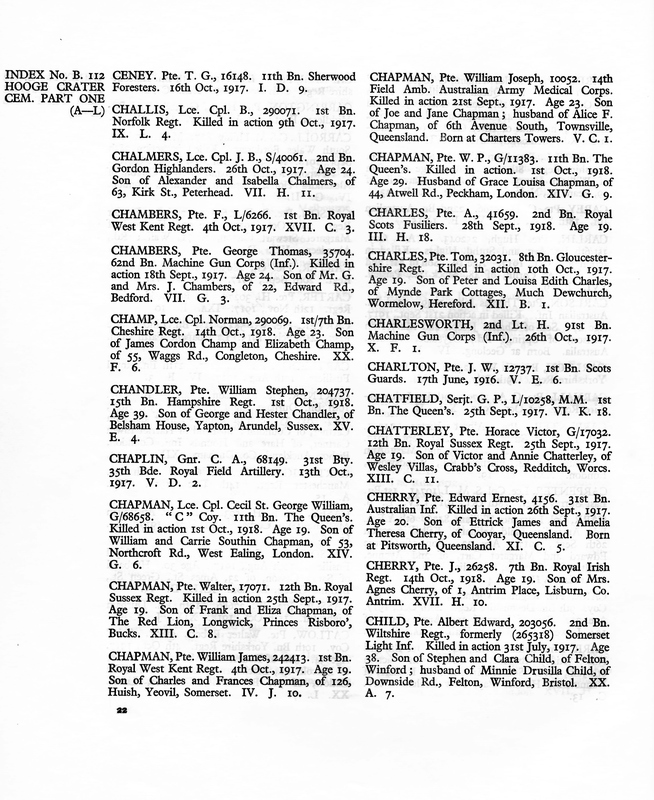 Either side of Billy’s (William James) entry (bottom left-hand side column) there are each two Chapmans – from Peckham, then West Ealing, then further out to Buckinghamshire and finally another WJ Chapman, this time from Townsville in Queensland, Australia. 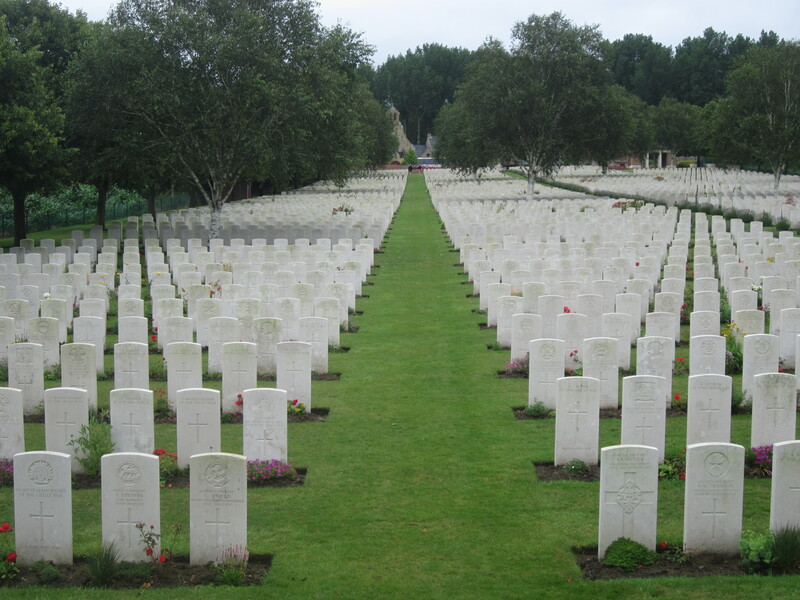 The Hooge Crater Cemetery contains, as far as I could tell, graves of those who travelled from all corners of the empire – from Britain, Australia, Canada, India, Ireland, New Zealand, South Africa and the Caribbean. Imagine coming all that way to end up there. Imagine the equivalent graves – for the Germans, French, Belgians, Russians and Americans. The final piece of the jigsaw is shown here too, though it’s hard to see the detail. 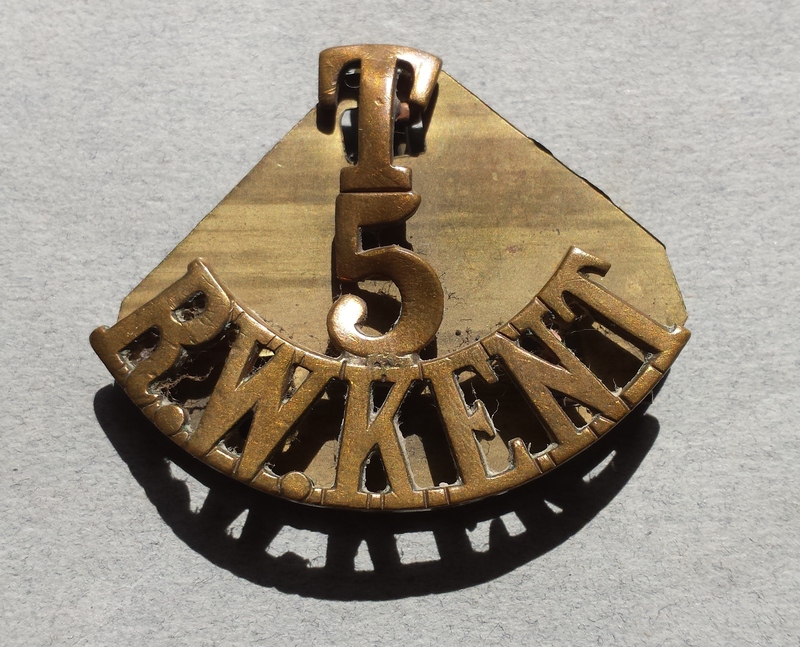 It’s similar to the earlier RW Kent brass badge I showed, only this one was wrapped in old paper. Most notably, the badge is covered in dirt, maybe once mud. I’ll never know but did Billy fall in that badge? Did someone rip it from his uniform? The account above would suggest that wasn’t likely. And why take his badge – common to hundreds of men – rather than something more personally identifiable? But why would he keep it, not clean it, maybe send it home or give to someone else? Another mystery, this one I’ll never be able to solve. Though it’s crossed my mind more than once whether to get some kind of soil analysis done. As I arrived at the Hooge Crater Cemetery in south Belgium that muddy badge came to mind more than once. Sure, I had googled the place’s location and I knew it was well-known, with stone work and an epic sweep designed by Edwin Lutyens, an architect maybe best known for Indian capital New Delhi. But I somehow expected something dingy, a little rough around the edges, certainly smaller. It’s on a main road, albeit in the countryside, and opposite is a small restaurant/museum for those mainly turning up in tour parties. I wondered how many had a personal interest and how many were there for the history, whatever their connection. The day I was there I saw at least as many people taking a break from cycling. Not only was it a Sunday afternoon in the Low Countries but the Tour de France was on. I expected khaki and got lycra. In a couple of the photos here I just wanted to try to catch the scale of the place and how its surroundings have changed compared to the photo from the 1920s. But then there’s me and Josie (visiting her great great uncle as his youngest relative from his parents’ line), perched awkwardly next to his resting spot. I took the following shot on purpose to include the graves on either side of his. To the right as we see it below is ‘A SCOTTISH SOLDIER OF THE GREAT WAR – KNOWN UNTO GOD’. That kind of anonymous grave was quite common, if not the majority of those there, and I wanted to ask how they knew his nationality but not his identity. But then I didn’t want to ask too hard, for fear of how that might have come to be. To the left side is ‘Private S.A.SHOEBRIDGE’ – like Billy from the RW Kent regiment and with the same date of death, 4 October 1917. But he was aged 38. Was he one of the men in the group picture from earlier? Was he the older man lying in the front row, cup of tea in hand and without stripes, meaning he was a private? More importantly, what world did he leave behind? Children, as well as a wife and other family? Our preconception is of the ordinary rank and file being young, often teenagers like Billy. The classic war quotation (actually from the Vietnam era 50 years later) comes to mind: “Old men dreaming up wars for young men to die in”. But what was his story? I’d like to think that they’re resting together because not only did they fall on the same day but then someone noticed the dates and regiments and saw to it that they would be side by side forever. And every time I came back to ‘What was his story?’, I found myself looking out over the hundreds of other headstones, each with families, people missing them, at least back then. What could I know about them when I really knew so little about Billy? I’ve come to realise that when culturally we talk about the ‘Unknown Solider’, we aren’t just talking about all the actual people who have died in war. It’s also about the idea that we can still respect and be thankful for those we never knew, who in some way expected to be taking care of future generations they would never know. That’s about as big as it gets. After the visit to the grave side, also the Hooge Crate museum, I had learnt a lot. I don’t know how much Josie will remember, not yet being eight, but at the time she was taking in the scale of loss and why would grown-ups do that? Today I look at the documents and photos around Billy and his death in a new light. 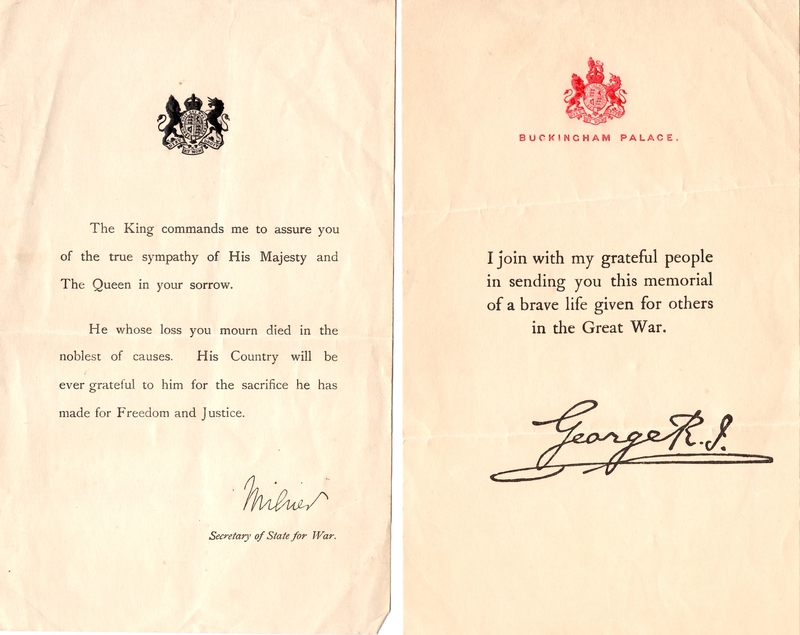 I see medals, posthumous notes from the king that all relatives must have been sent, and the idea that it was all a noble cause – ‘His Country will be ever grateful to him for the sacrifice he has made for Freedom and Justice’. I guess I’m even surprised the state said thank you. German forces attacked the château between 24 May and 3 June 1915, and, despite the detonation of a British mine by the 3rd Division, leaving a massive crater, took control of the château and the surrounding area on 30 July. The château and the crater (craters being strategically important in relatively flat countryside) were taken by the British 6th Division on 9 August. It was reclaimed by the Germans on 16 June 1916 and retaken by the British on 31 July 1917 when the 8th Division managed to push past it by about a mile. The Germans retook the site in April 1918 as part of the Spring Offensive but were expelled from the area by the British on 28 September as the Offensive faltered. During this time, the chateau was completely destroyed along with the entire village. As I think is obvious if you’ve read this far, I’m no historian of the First World War. I’ve always been interested but my family connection – which I’d long known generally, only in the last year in more detail – was what’s made me think harder about what happened. This year, we’ll hear more about that conflict than probably any time in recent decades. Understandably so. But it’s so hard to really feel like we knew what it was like to be in it, either fighting or worrying and grieving for those on the front line. I hope this family story has shed a little new light on what it was like, as either the person going to war or those left behind. It has helped educate me and I know the loss of Billy, and all that represents, stayed with my grandmother until she died, 71 years after her brother.